Azaleas are acid loving plants. They grow best in light shade, and need protection from midday sun and winter sun. They prefer a moist, well drained soil with a pH of 5.5.Check the soil pH before planting, especially if planting along a foundation where soils tend to be more alkaline. Adjust the pH, as needed. Mix in plenty of inorganic matter, and well rotted manure. Selection of a location is important. Azaleas can be harmed or killed by sustained winds. Select a location out of the direct sunlight if possible. Protection from strong midday sun is important. Otherwise the leaves can dry out and/or burn. Northern exposures are best. It is also important to provide protection from winds. A low lying area, or one protected by a building or a hedgerow is a good choice. 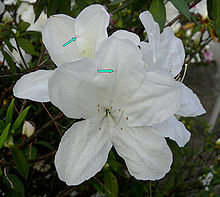 Azaleas prefer a moist soil. It is important to water the plants during extended dry spells, even in the fall. Using pine needles (acidic pH) as mulch works to help keep the soil moist, and maintain/add acidity to the soil. Roots are shallow, so mulching will help to keep the weeds down, without disturbing the root system. We lost a lot of newly planted azaleas during the summer 2010 drought. We’ll see what is left come spring 2011.